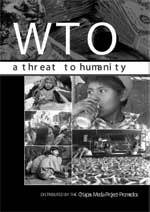 WTO: A Threat to Humanity is an in-depth look at the history and current policies of the World Trade Organization. A Threat to Humanity (an indigenous/non-indigenous co-production) was originally made for indigenous and campesino communities in Mexico and Central America who wanted an explanation of WTO and how it's policies are affecting their communities. Among the issues discussed are NAFTA’s impact on corn production in Mexico, the effects of genetically modified seeds on world agricultural systems, agricultural subsidies in developed countries and it's negative impact on food production in developing countries, intellectual property and patents on indigenous plants and knowledge, privatization of natural resources and south to south competition for cheap labor.